Synonym: Splen (in Greek); Lien (in Latin). To filter blood by removing worn out RBCs and microbial agents from the circulation. To fabricate RBCs in fetal life and lymphocytes after arrival. To provide resistance to the body by creating immunoglobulin M (IgM) by plasma cells. To keep RBCs and release them in circulation when demanded. The spleen located in the left hypochondrium between the fundus of the stomach and the diaphragm, behind the midaxillary line opposite the 9th, 10th, and 11th ribs. Its long axis is located parallel to the long axis of the 10th rib. During respiration, it moves a bit from its position. 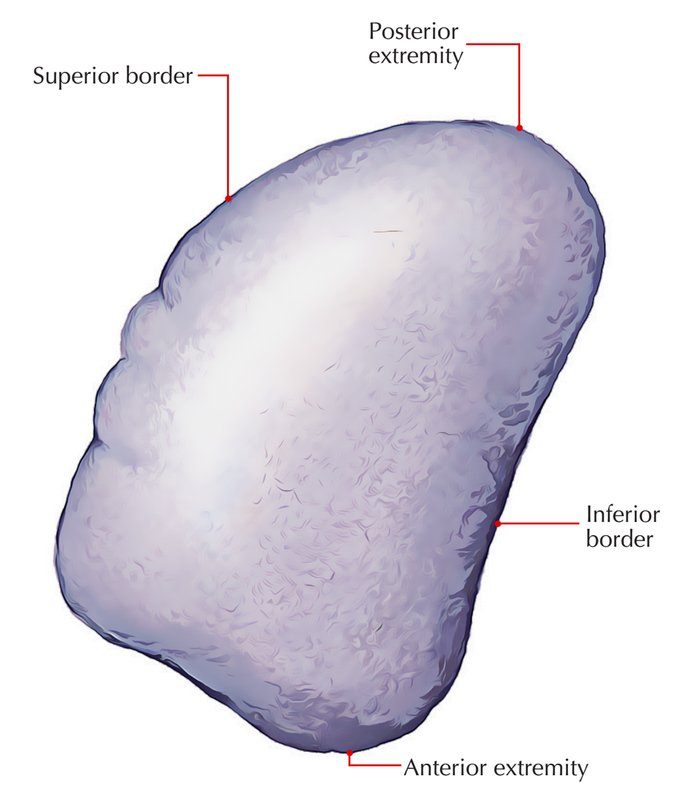 The spleen is a wedge-shaped soft organ with purple colour. The size of the spleen nearly corresponds to the fist of the subject. Categorization of the spleen based on its shape: According to the shape or create, the spleen is classified into 3 types: (a) wedge-shaped (44%), (b) tetrahedral (42%), and (c) triangular (14%). The Harris’ dictum of uneven numbers 1, 3, 5, 7, 9, 11 summarises some splenic data, viz., it measures 1 inch in thickness, 3 inches in breadth, 5 inches in length, weighs 7 ounces, and is located deep to 9, 10, and 11 ribs. The spleen is marked on the surface on the left side of the back of the trunk. Its long axis corresponds to that of the 10th rib. Its upper border corresponds to the upper border of the 9th rib, and its lower border corresponds to the lower border of the 11th rib. Its medial end is located about 5 cm from the posterior midline of the body in the level of spine of T10 vertebra and lateral end at the midaxillary line. 2 ends (anterior and posterior). 3 edges (superior, inferior, and intermediate). 2 surfaces (diaphragmatic and visceral). Some authorities also explain 2 angles: (a) antero basal angle at the junction of superior border with anterior end and (b) posterobasal angle, in the junction of inferior border together with the anterior end. The anterobasal angle is referred to as clinical angle of spleen because it’s felt first when the spleen is enlarged. The anterior end (lateral end/lower post) is broad and is more like a border. It’s pointed downward, forward, and to the left. It’s related to the left colic flexure in front and phrenicocolic ligament below. The posterior end (medial end/upper post) is blunt and rounded. It’s pointed upward, backward, and medially in the direction of the vertebral column. It’s related to the upper pole of the left kidney. The superior border is thin and convex. It divides the visceral surface (gastric belief) from the diaphragmatic surface. It characteristically presents 1 or 2 notches near its anterior end. These notches suggest the spleen develops by the fusion of different masses of lymphoid tissue (lobulated development). The inferior border divides the visceral surface (renal belief) from the diaphragmatic surface. It’s rounded and corresponds to the lower border of the 11th rib. The intermediate border is rounded and divides the gastric belief from the renal feeling on the visceral surface. The diaphragmatic surface is smooth, convex, and directed upward, backward, and to the left. The visceral surface is concave and uneven. It presents 4 beliefs: gastric, renal, colic, and pancreatic. The gastric impression is made by the fundus of the stomach. It’s the largest perception and is located between the superior and intermediate edges. The hilum of spleen is situated in the lower part of the belief. The renal impression is created by the left kidney and is located below and behind the gastric belief between the intermediate and inferior edges. The colic impression is created by the left colic flexure. It’s triangular in shape and situated in front of the lateral end. The pancreatic perception (occasional) is generated by the tail of the pancreas. It’s found between the hilum and the colic belief. The spleen is totally enclosed in the peritoneum with the exception of at its hilum, from where 2 peritoneal folds go- 1 to the stomach and 1 to the left kidney, named gastrosplenic and lienorenal ligaments, respectively. 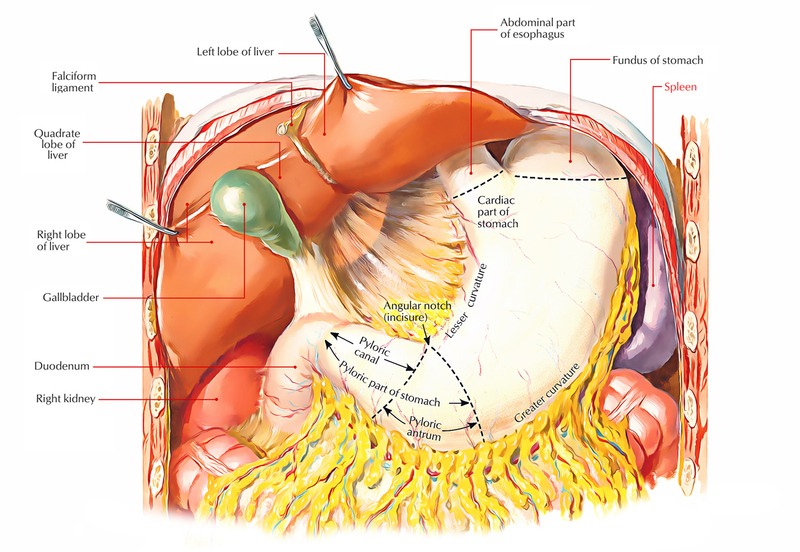 Gastrosplenic ligament extends from the hilum of the spleen to the upper one-third of the higher curvature of the stomach. It includes short gastric vessels. Lienorenal ligament goes from the hilum of the spleen to the anterior surface of the left kidney. It contains tail of the pancreas, splenic vessels, and pancreaticosplenic lymph nodes. 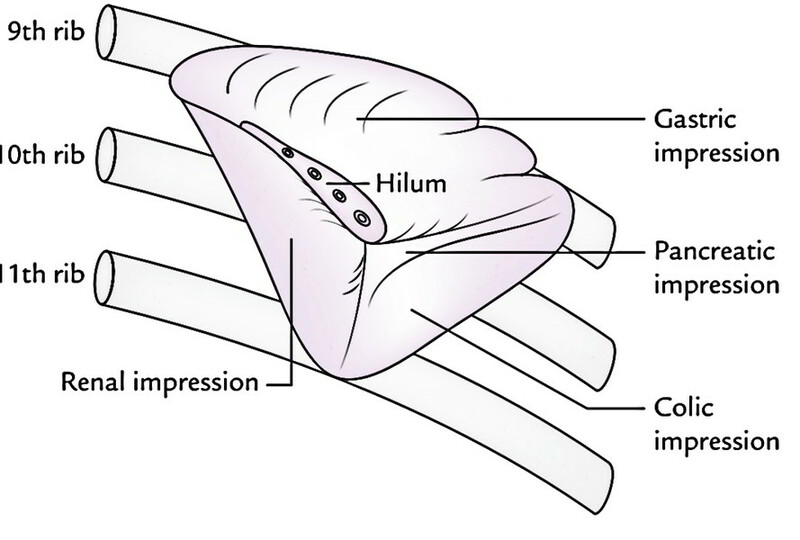 Phrenicocolic ligament is a triangular fold of the peritoneum which goes from the left colic flexure to the diaphragm reverse to the 10th rib. It enters below the lateral end of the spleen, which it supports; for this reason, it’s also referred to as sustentaculum lienis. Anterior surface of the left kidney. These viscera create feelings on this particular surface. The diaphragmatic surface of the spleen is associated with the diaphragm, which divides it from the costophrenic recess of the pleura, lung, and 9 to 11 ribs. 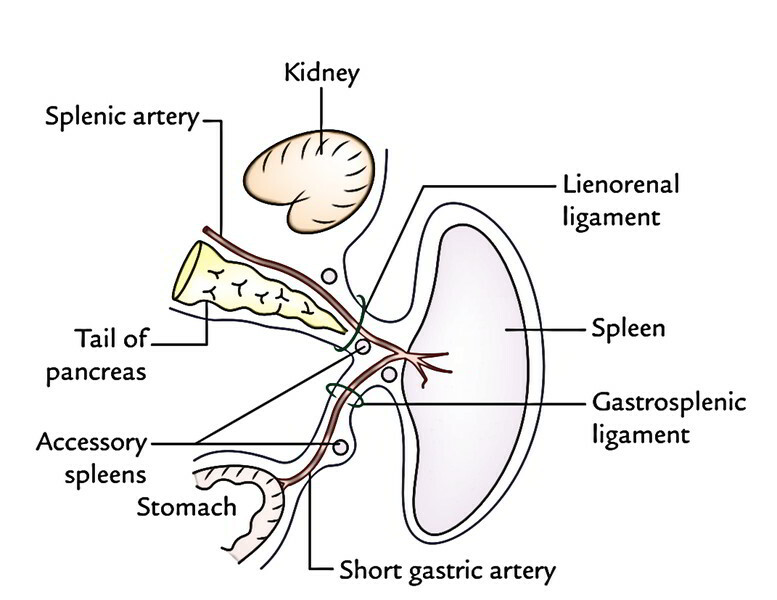 The spleen is supplied by the splenic artery, the largest branch of the coeliac trunk. It traverses via the lienorenal ligament to reach near the hilum of the spleen, where it breaks up into 5 or more branches, which goes into the spleen via its hilum to supply it. 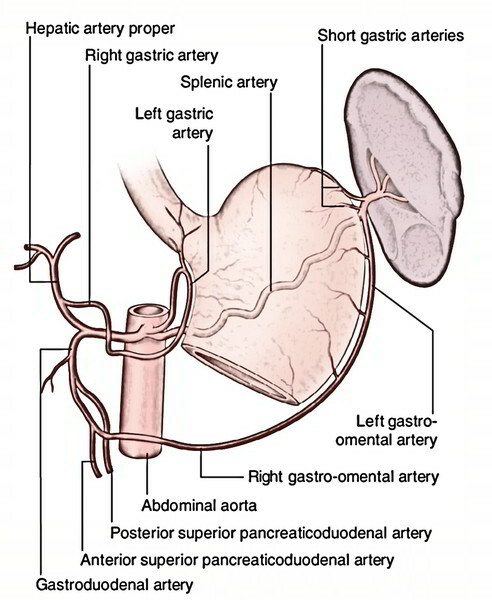 The splenic artery is unexpectedly tortuous to enable movements of the spleen following distension of the stomach and movements of diaphragm, without impediment to the blood circulation. The spleen is classified into 2 types, diffuse and streamlined, depending upon the branching pattern of the terminal branches of the splenic artery, which goes into the hilum. Diffuse type of spleen, if the terminal branches are long and originate far from the hilum. Dense type of spleen, if the terminal branches are small and originate close to the hilum. 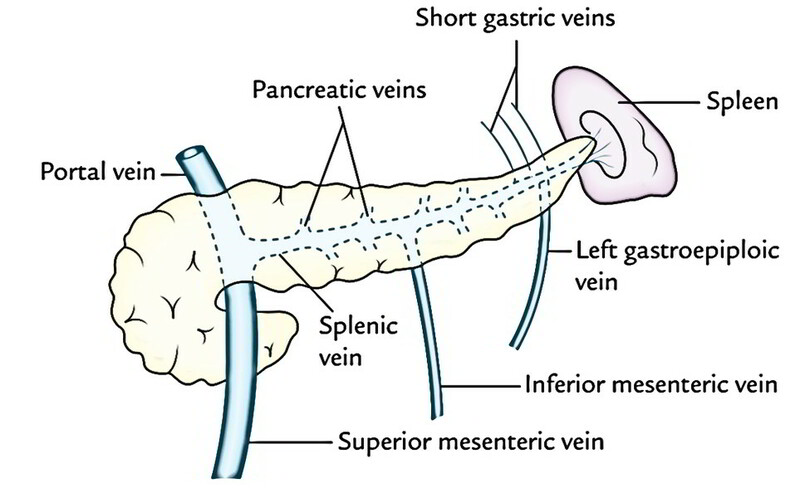 The venous blood from the spleen is emptied by the splenic vein, that is created at the hilum by the union of 5 or more tributaries which come forth from the splenic substance. The splenic artery inside the spleen normally supplied 2 branches- superior and inferior. These branches typically don’t anastomose and every branch supplied its own land (section). So, an avascular zone exists between these 2 lands. 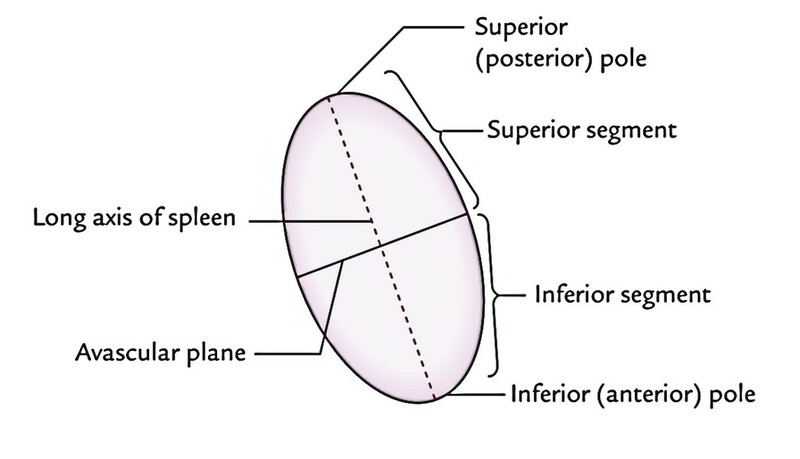 Thus, the spleen presents 2 sections, superior and inferior, divided by an avascular plane passing perpendicular to the long axis of the spleen. The knowledge of these vascular sections is crucial for segmental resection of the spleen to sustain the splenic tissue if demanded. The branches of the splenic artery inside the spleen are segmental in distribution, on the other hand, the tributaries of the splenic vein inside the spleen are intersegmental. The spleen grows between the 2 layers of the upper part of the dorsal mesogastrium from a number of condensations of mesenchymal cells. These different masses of mesenchymal cells (named splenunculi) fuse together to create the lobulated spleen. The passes on the superior border of the adult spleen suggest the lobulated development of the organ. The failure of fusion of splenunculi results in the formation of accessory spleens (splenunculi). All these are typically seen in the derivatives of the dorsal mesogastrium, viz. (a) in the gastrosplenic ligament, (b) in the lienorenal ligament, and (c) in the greater omentum. Scarcely they’re created in the left spermatic cord and in the broad ligament of the uterus (left side). The normal spleen isn’t palpable; yet, it can be mapped out by percussion. When it’s enlarged more than twice of its size, it becomes palpable at the left costal margin during deep inspiration. The enlargement of the spleen (splenomegaly) takes place in number of diseases. The spleenmay increase in size by as much as tenfold (huge splenomegaly). The common reasons for massive splenomegaly are: (a) malaria, (b) cirrhosis of liver, (c) chronic myeloid leukemia, and (d) kala azar. The quite large (huge) spleen projects downward and medially toward the right iliac fossa in the direction of the axis of the 10th rib. The enlarged spleen could possibly be distinguished from the enlarged kidney by the presence of one or more notches on its superior border. The splenectomy (surgical removal of the spleen) is occasionally performed when the spleen is ruptured or accidentally nicked at surgery. It’s also performed in treating specific blood diseases. If the accessory spleens are in the splenic pedicle they must also be removed. The removal of spleen doesn’t impair the immune response critically. In spite of the fact that nicely shielded by 9th, 10th, and 11th ribs, the spleen is the most often ruptured organ in the abdomen following severe external whack. The pain is referred to the left shoulder as a result of aggravation of the left dome of diaphragm by the splenic blood. It’s termed ‘Kehr’s sign‘. In which quadrant of the abdomen does the spleen lie? The gastrosplenic and splenorenal ligaments are part of which structure? Which of the following structures lies anteriorly to the spleen? Which vessel provides the arterial supply to the spleen? What is the embryonic origin of the spleen? The nerve supply to the spleen is which of the following?